This entry was posted in Uncategorized and tagged Bill Hicks, Consciousness, death, experience, Illusion, imagination, Life, LSD, matter, mushrroms, slow vibration, vibration. Bookmark the permalink. A summary of the whole mystery, amazing… thanks for posting this. I put him up there with Carlin and Pryor. He died too soon, too young. 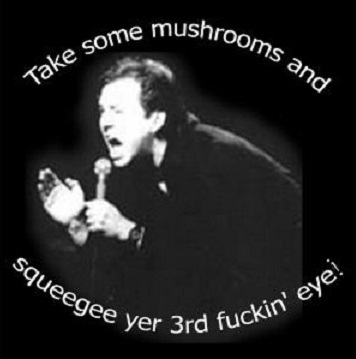 Comedy genius was Bill Hicks, “musta’ bin one-a tham book-reeders”. :) The first – maybe the only – comedian to synthesize covert CIA operations and Zen Buddhism in his scripts, leaving audiences stunned at what just hit them. One could see that George Carlin was influenced by Bill Hicks’ after Hicks passed, along with others, although how could any comic not be influenced by him?